I needed this more than anything else. The pull was irresistible, I had to succumb to its pull. I started the day by sleeping in. Sleeping in, for me, meant 7:30am. I convinced myself that I didn’t need to go on a run that morning, and I should take a rest day since I was sore from Crossfit on Thursday. It didn’t take much, but I was convinced. I ate a simple breakfast, and took my time getting ready for the day. Then out the door I went for a little shopping trip out in Mount Kisco. After doing my part to help the economy, I was hungry. Instead of doing my usual grab and go, or going home to eat whatever I could pull together, in the spirit of the lazy Friday, I opted for stopping in my favorite breakfast place to give their lunch a try. 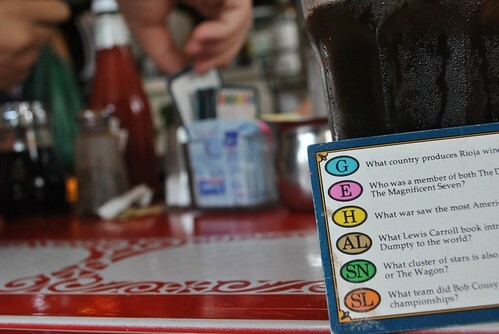 Wobble Cafe and their Trivia Pursuit Cards. Dining alone is tough. But, at the Wobble Cafe, I felt at home as I munched on my grilled Munster with tomato on multigrain with fries. I’ve been craving a grilled cheese, and this hit the spot. Once I got home, I started my cake. My brothers birthday was this past Monday, and due to all of our busy schedules, he never got a proper birthday cake. As a baker, this was inexcusable. He needed a cake, and I needed to make one for him. 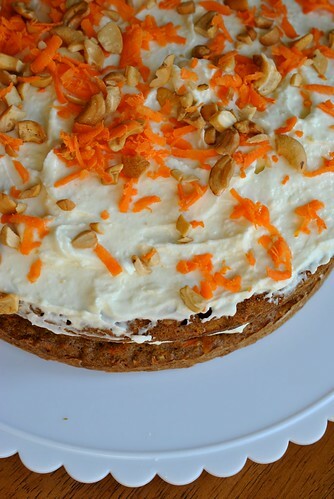 He loves Carrot Cake, and he loves Cashews. 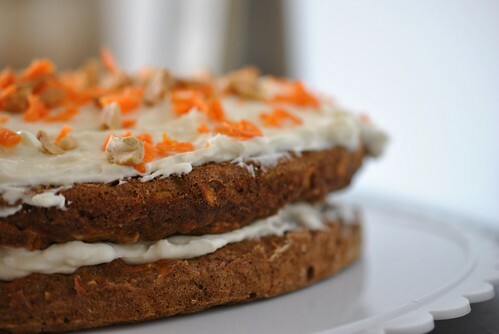 I have never made a Carrot Cake, nor have eaten many Carrot Cakes to know what I good one tastes like. This was going to be interesting. 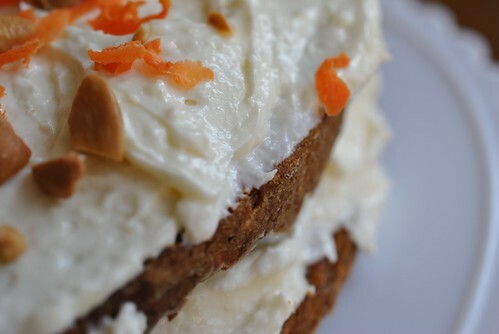 A recipe I found via the Huffington Post incorporated cashews into the carrot cake. I figured this would be a good one to start with. – The recipe calls for 1 teaspoon of ground Cardamom, which costs $15 for a bottle. I was not going to buy a whole bottle for 1 teaspoons worth. So, I substituted 0.5 teaspoon of pumpkin pie spice since it had Cardamom in it as well as the other spices used for this recipe. – Instead of a whole cup of sugar, I used maybe 0.75 cups of sugar and eyeballed about a 0.25 cups of Grade B Maple Syrup. – I browned the butter instead of just simply melting it. 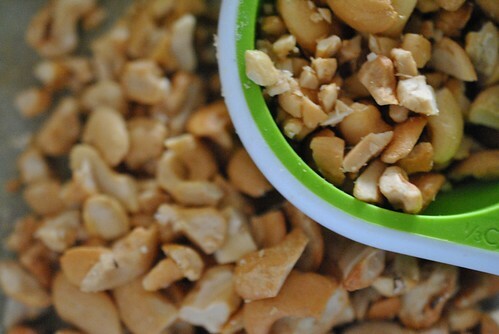 About 1/4 cup of cashews, coarsely chopped. Preheat the oven to 350 degF. Put the garnish items into a pan for toasting and set aside. Prep two 9″ cake pans by buttering and flouring the pan, then place a circular piece of parchment paper on the bottom and butter and flour the paper. Set pans aside. Once the oven comes to temp, put the garnish items into the oven to toast for about 10 minutes. Remove, from the oven after 10 minutes and give it a toss. If the nuts aren’t fragrant yet, stick it back in the oven for another 3 minutes. Once the nuts are fragrant, they are toasted. Remove from oven and set aside. 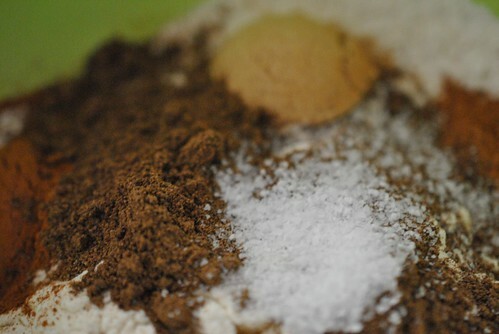 In a small bowl, combine the dry stuff (flour, spices, salt and baking soda). Give it a good stir with a fork to “sift”. In the mixer bowl, combine the butter and sugar and maple syrup and mix until combined. Add in the eggs one at a time, beating well after each. By hand, add the flour mixture into the wet mix and fold together until it just starts to come together. 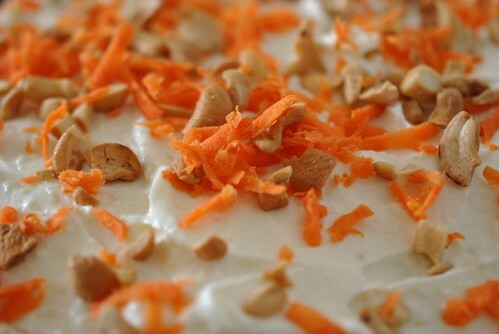 Add in the carrots and cashews and continue folding until it comes together all the way. At this point, my batter was really thick. This caused some concern since cake batter was not supposed to be this thick. Did I misread something (which happens more often than it should)? Concerned, but not enough to stop, I spooned the batter as evenly as I could between the two pans and smoothed out the tops as best I could. Into the oven they went for about 30 minutes (switch positions halfway). When they were done (toothpick comes out clean), I pulled them out of the oven to start cooling. The cakes looked so dense and un-cake like. The tops were all bumpy and uneven. How was this supposed to make a layer cake? I wasn’t too happy about this, but I had to finish. After the cakes hung out for about 5 minutes, I flipped them out onto cooling racks to cool the rest of the way. Once they were almost completely cooled, I started the frosting. 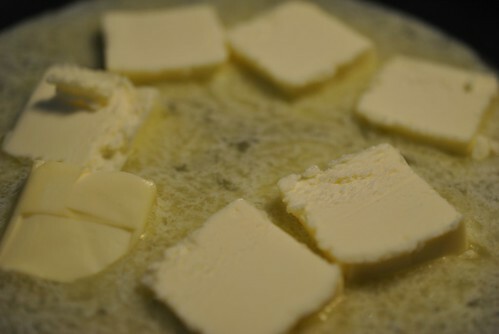 Into a mixing bowl went the butter and cream cheese. Beat until fluffy and add in the confectioner sugar and vanilla extract and continue beating until smooth. Once the cake was completely cooled, I placed the ugly half on top of my cake stand with pieces of parchment paper lining the outside. I decided, the only way to make this looks remotely like a layer cake was to layer them top to top, using the frosting to fill in the uneven parts. So on top of that uneven surface, I spread the frosting around the cake, more around the outer edges than the center. I should have made the full recipe of the frosting, but at this point I had to make it work. Once the frosting was down, I flipped the second half upside down so the bottom of the cake was now the top of the cake. I frosted only the top, leaving the edges exposed. Once all the frosting was used up, I sprinkled the garnish on top and threw it in the fridge to set a little bit before packing it up to bring to my parents house for dinner. Even though the cake looked super dense, it was actually really moist. It had a sweet bread quality to it, and the amount of cream cheese frosting, while I thought wasn’t enough, was just enough to be a supplement rather than the main event. 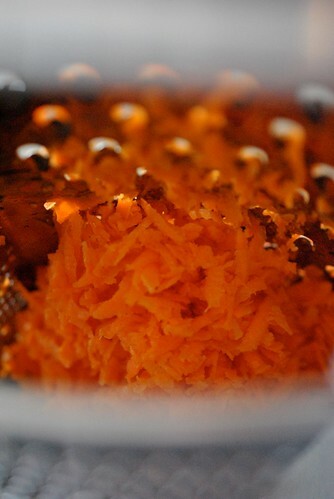 The carrots added a subtle sweetness and the maple syrup gave it some extra warmth. I really liked the additional crunch the cashews provided. I really don’t know where I went wrong to end up with what I had. I was imagining something more along the lines of a layer cake type cake, something lighter and fluffier. Given what I did make, I think the next time I make this, I’d consider making it more of a snack cake rather than a layer cake. But most importantly, my brother liked it a lot. Therefore, I consider this a success! 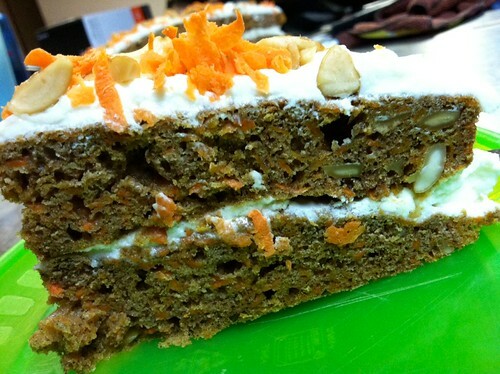 This entry was posted in Cake, cheese, Dessert, Uncategorized and tagged Cake, carrot, cashews, cream cheese, Wobble. Bookmark the permalink. This doesn’t sound lazy at all! 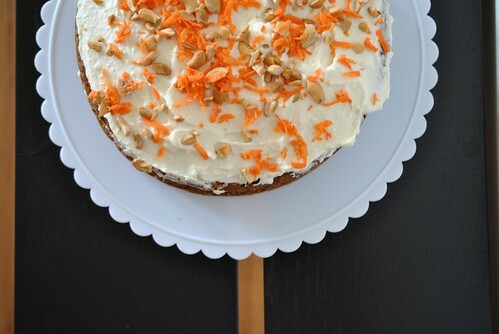 I’m a recent carrot cake aficionado. I’m intrigued by the addition of cashews in this one, glad your bro liked it. Would you be freaked out if I said not only do I enjoy working with you and playing kickball with you but now I really love you? I can not wait to try this recipe of my absolute favorite dessert.